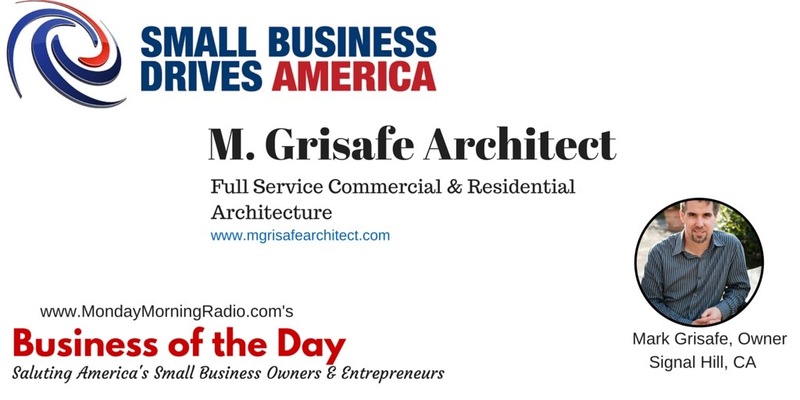 Saluting Mark Grisafe and M. Grisafe Architect, another great small business. For a residential and commercial architect, Mark has an unusual business motto: Advise, Advocate & Collaborate. It’s an unconventional approach that over the past decade has helped him grow his Spring Hill, California, firm into a thriving business. While many professionals shun taking advice from their clients – think lawyers and accountants, for example– Mark actually cultivates his clients’ involvement at every step of the way. In turn, they consistently reward him with repeat business and word-of-mouth referrals. Mark shares his unique blueprint for building a professional practice in close cooperation with his clients. Hear his story http://tinyurl.com/mmr122815.